Steven (Chicagoland, United States) on 27 February 2019 in Plant & Nature and Portfolio. Spotted on a concrete floor during a recent temperature thaw. I thought of processing in B&W, but then it didn't stand out so well. Photo captured February 22, 2019. La nature fait de jolies choses. Jolie texture offerte par Dame Nature. Beautiful to see how nature is ! I like to walk on ice when it's fragile because of the noise my shoes make when they crack. Beautiful photo with ice on the floor . Makes a great image Steven. Oh! I like this much!! It's magnefiek the details from the nature. I like the strong shapes and texture. Feel like taking a handful and tasting these !! I like the randomness of this color version. Very well composed. La nature est surprenante et tu as su la capter Steven ! Bravo ! Magnifiques textures ! Je pense que c'est un bon choix d'avoir laissé en couleurs. Nicely captured! Aren't they just wonderful! Ice patterns as so interesting. Well done. Those crystals seem quite large! Way too cold in Chicago. I read where more frigid weather is headed for the midwest in early March. 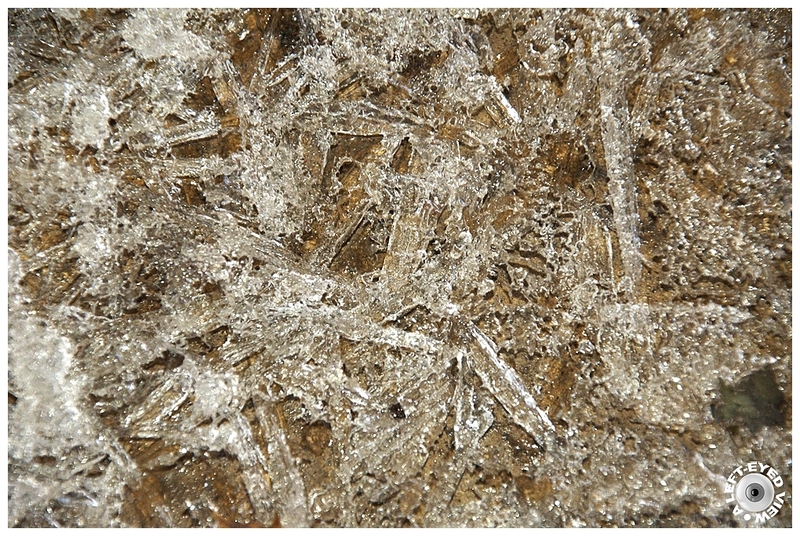 I have always thought ice crystals were so interesting. This image really displays their structure. A wonderful close up. An artwork created by Mother Nature, which Steven knew how "to enjoy" very well.